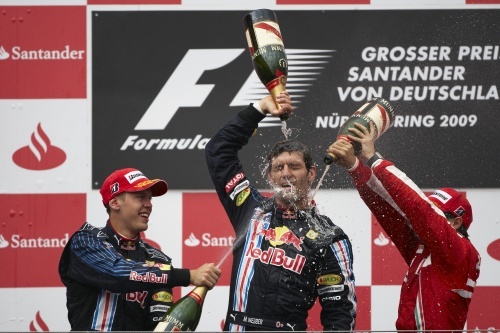 BRDC Full Member Mark Webber overcame a drive through penalty to storm to his first Formula 1 victory at the Nurburgring yesterday. The Australian Red Bull Racing driver had been on solid form all weekend, having also taken the first pole position of his Formula 1 career. But he did not make it easy for himself as he was handed a drive through penalty for 'causing a collision' at the start of the race. But he managed to get out in the lead with Rubens having been in to pit. At the start of the race it was a three-way battle between Mark, Honorary Member Rubens Barrichello and BRDC Full Member Lewis Hamilton, going in to the first corner. But with Mark and Rubens coming together Lewis’s best start of the season was then scuppered as he too clashed with Mark and he picked up a puncture and damage to the rear of his McLaren. The pit stops made things interesting with Rubens suffering a problem with his fuel rig at the second stop, which delayed him returning to the track. This moved him out of podium contention while BRDC Full Member Jenson Button also moved out of a podium spot following his final pit stop. Jenson finished fifth just a place ahead of his Brawn GP team-mate, Rubens, while BRDC Honorary Member Fernando Alonso was just one place behind him. Lewis Hamilton’s first lap crawl back to the pits and the damage to his car saw him finish 18th. Jenson still leads the drivers championship.